Do you know which posts get the most likes? Cakes. Always cakes. And so I keep baking them. Because what food blogger doesn’t want lots of likes on his posts? Seriously though, cakes are great as dessert because you can make them in advance and when it is time to serve dessert, all you have to do is to triumphantly present the cake to a chorus of oohs and aahs and then cut it. And so I very often bake a cake for a dinner party. The possibilities for cakes are endless. 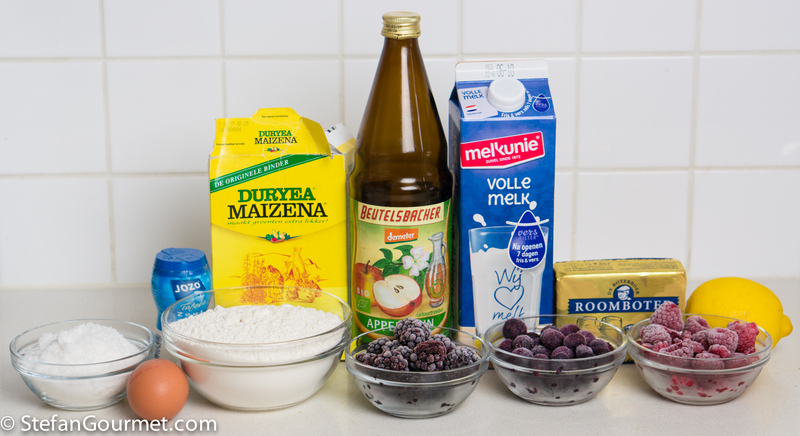 Recently, Silva posted a berry pie using a different type of pastry with milk. 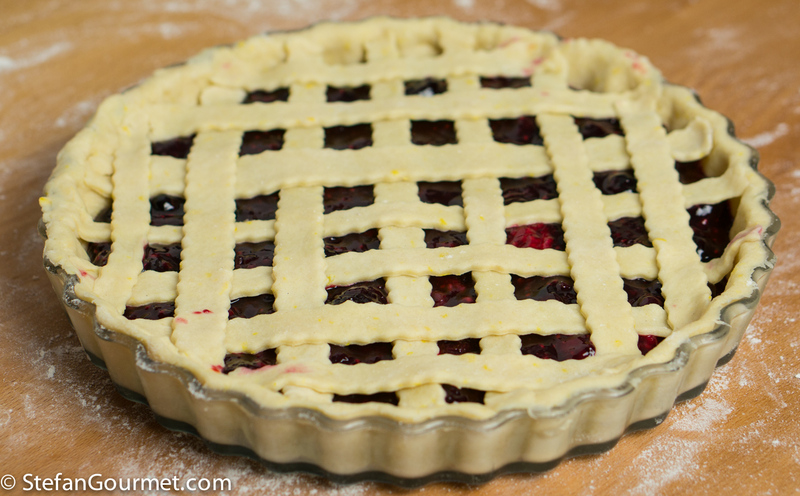 I wanted to try this pastry, but felt like making a crostata instead of a pie. And I did make it with berries. 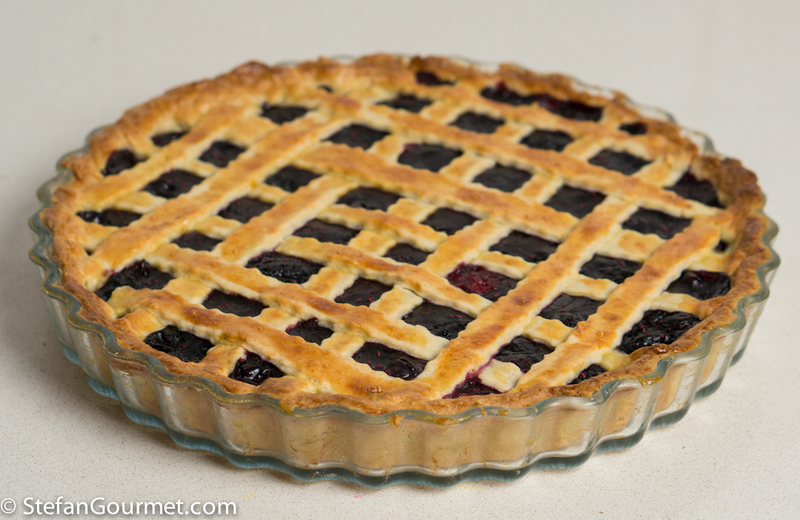 The nice thing about berries in a tart like this is that you can use frozen berries and you won’t notice the difference as the berries are cooked anyway. 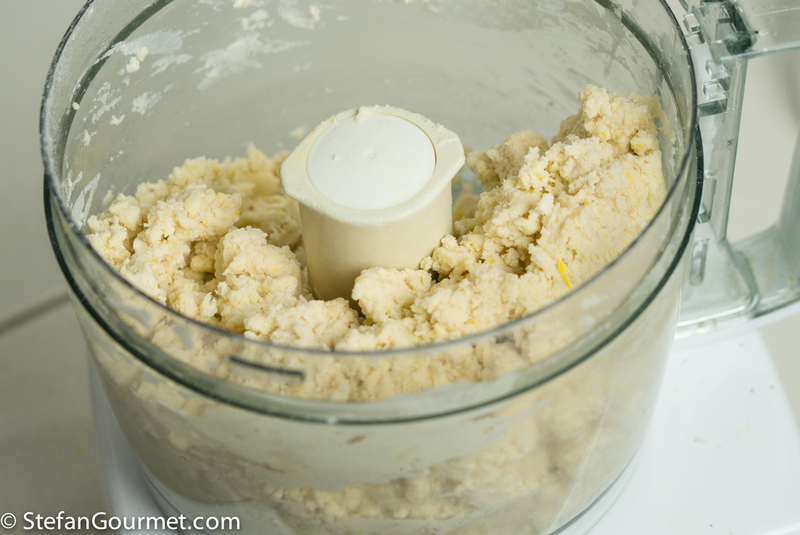 Combine 300 grams pastry flour, 2 Tbsp sugar, the grated zest of a lemon, 120 grams butter and a pinch of salt in the bowl of the food processor. …and 2 Tbsp cider vinegar. 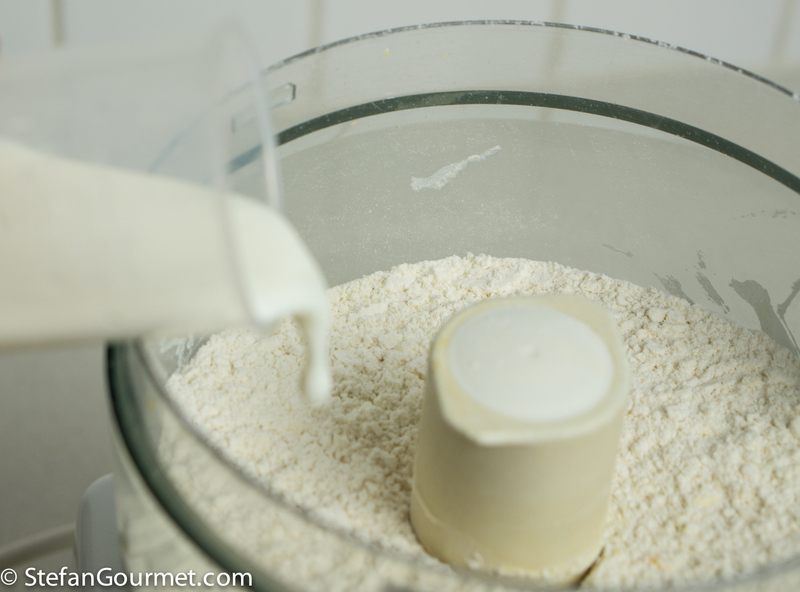 Process briefly until the dough just comes together. 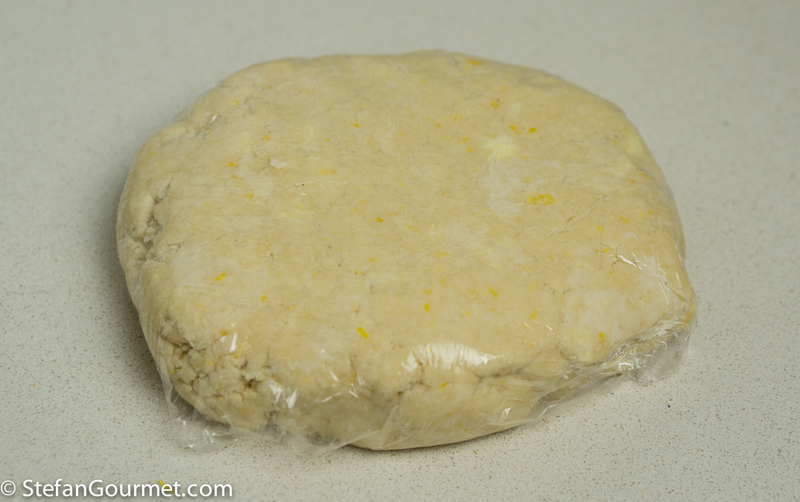 Gather into a ball, flatten it to a disc, wrap in cling film, and refrigerate for half an hour. 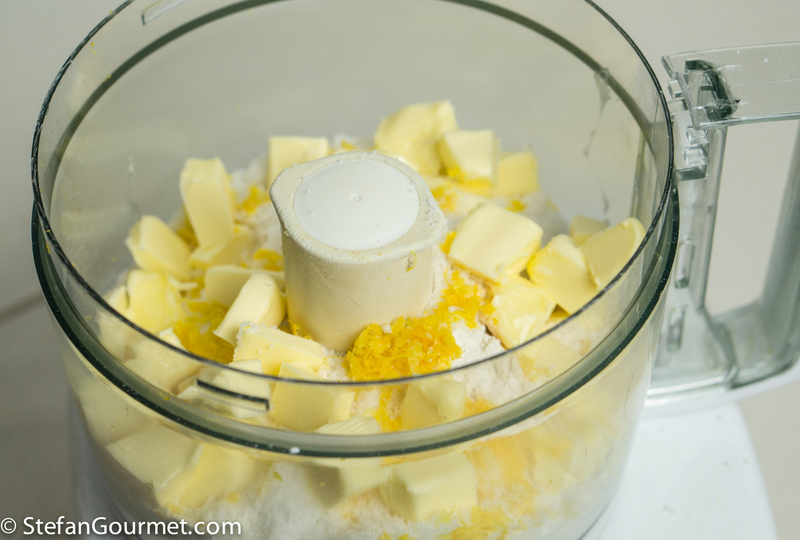 You should still see small pieces of butter in the dough. 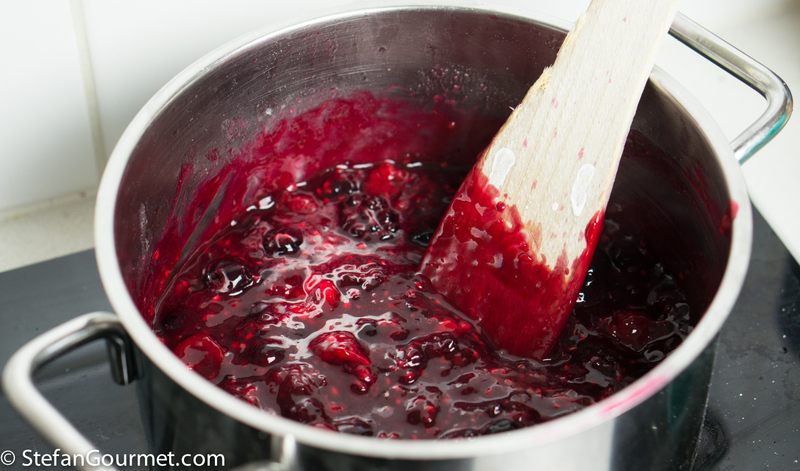 Put 150 grams raspberries, 150 grams blueberries and 150 grams blackberries in a saucepan. 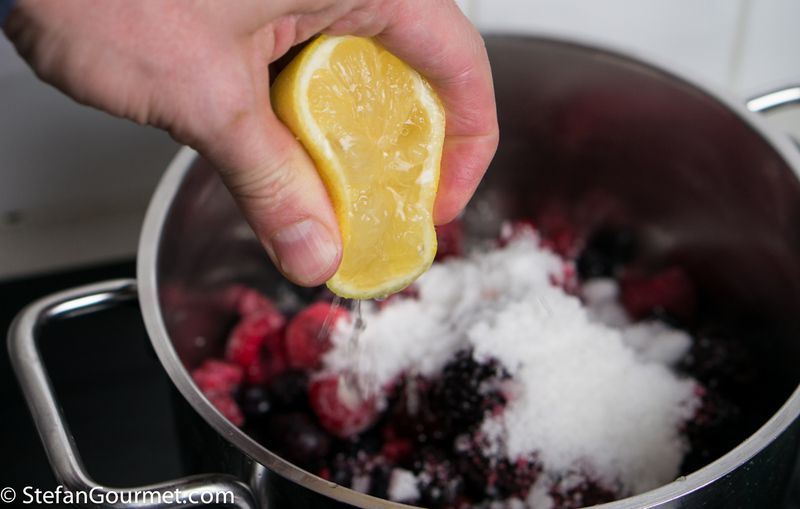 Add 50 grams sugar and the juice of 1/2 lemon. 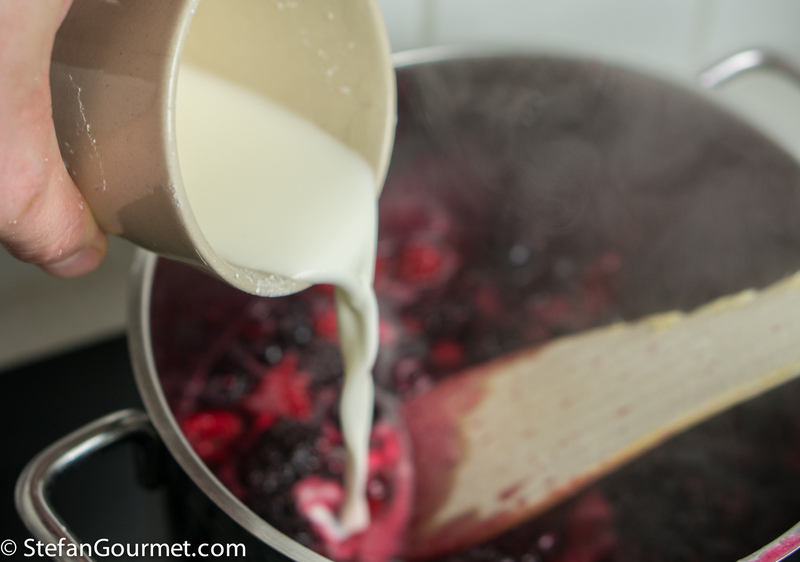 When it boils, mix 2 Tbsp corn starch with 2 Tbsp cold water to make a slurry, and add the slurry to the berry mixture. 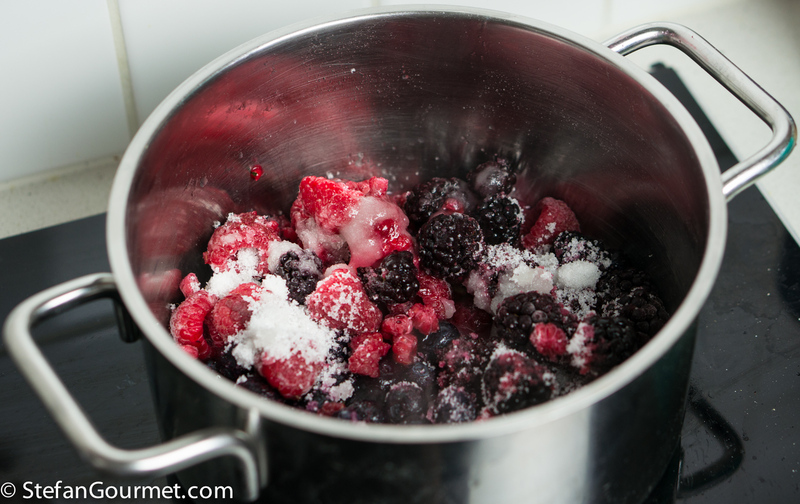 Cook, stirring, until the berries have thickened, about a minute. Then turn off the heat and allow to cool. Preheat the oven to 180C/350F (not fan forced). 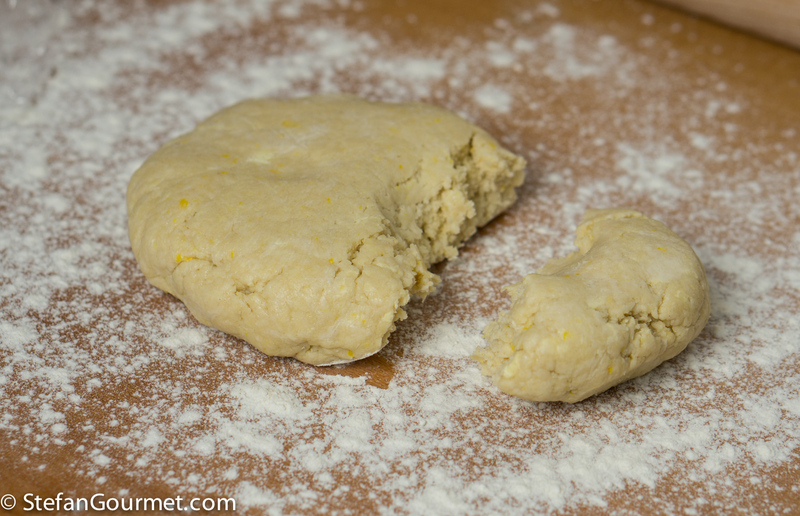 After the dough has rested, divide it into 3/4 and 1/4, and put it on a floured work surface (a wooden surface works best). Butter a 27 cm (11″) tart pan. 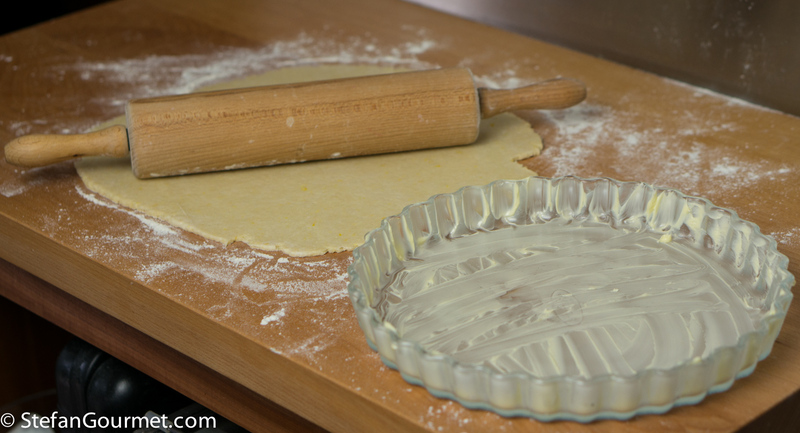 Give the large piece of dough a round shape with your hands, then roll it out with a rolling pin until it is the right size for the tart pan including the borders (i.e. about 32 cm or 13″). Roll out in different directions, starting from the center. That is the best way to roll it out in a circular shape. 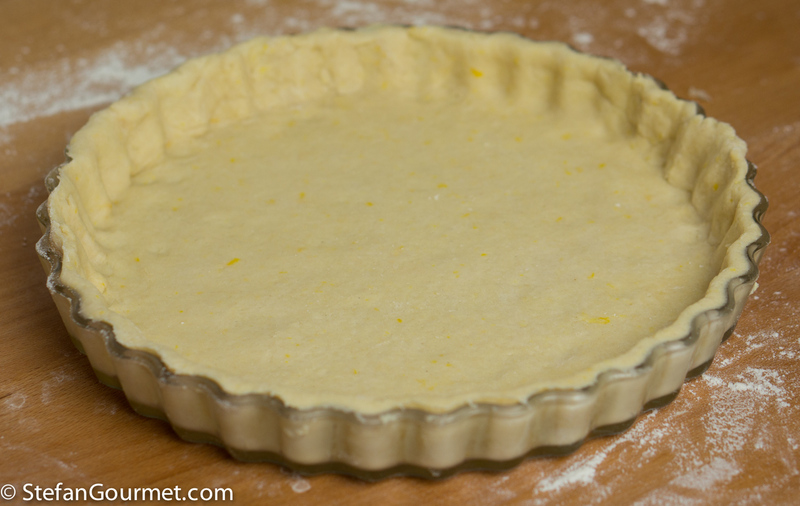 Line the tart pan with the dough, rolling the rolling pin over the top of the tart pan to remove any excess dough. 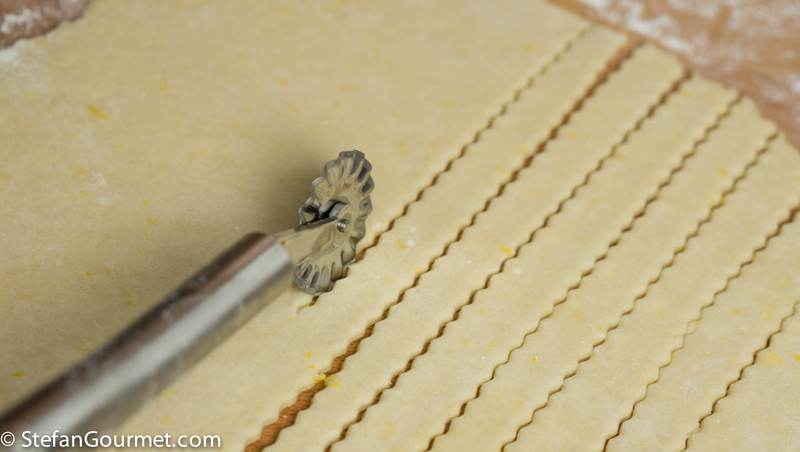 Roll out the remaining pastry, and use a pastry wheel to cut it into strips of about 1 cm (1/2 inch) wide. You could also use a knife, but with the wheel the strips will be more pretty. Pretty is important when baking. 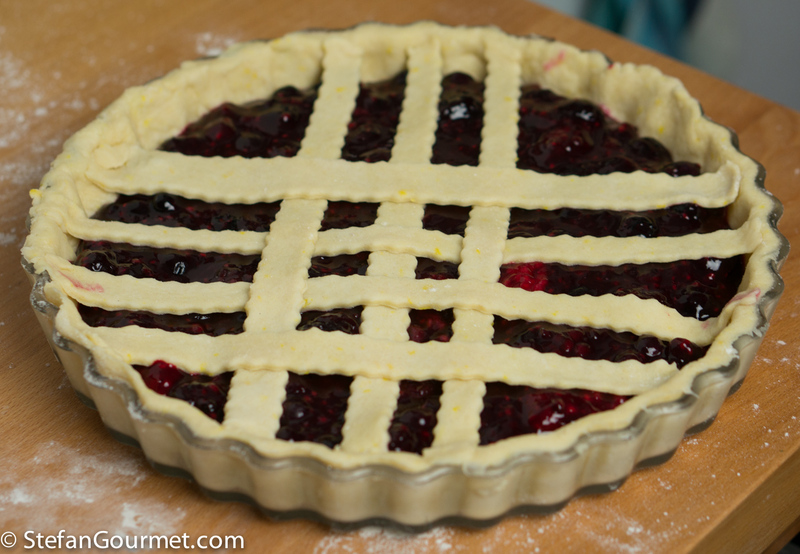 …until you have covered the tart with a nice regular lattice. 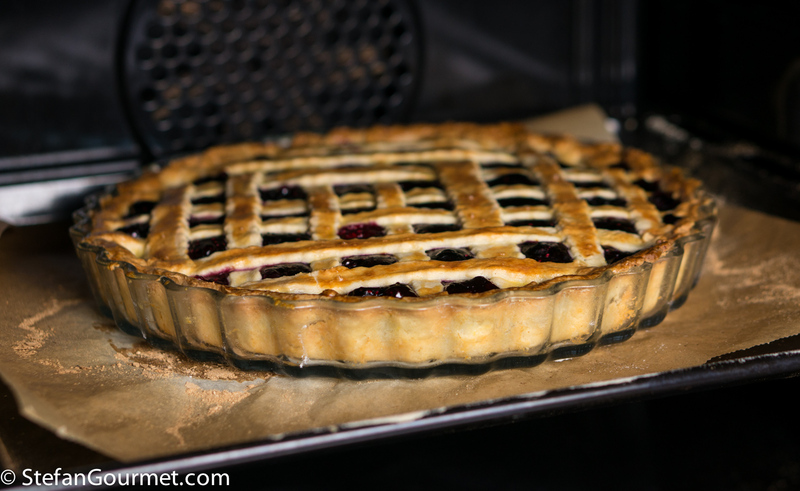 Bake the tart for 45 minutes at 180C/350F (not fan forced), or until golden. 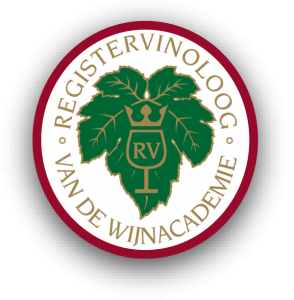 This is great with a red dessert wine such as Brachetto d’Aqui, Rosenmuskateller, Black Muscat, or Recioto della Valpolicella. Perhaps even a Ruby port, but that may be a bit high in alcohol. The dark berry fruit works best with a red dessert wine, although a fortified or dried-grape (passito) white dessert wine wouldn’t be terrible either. 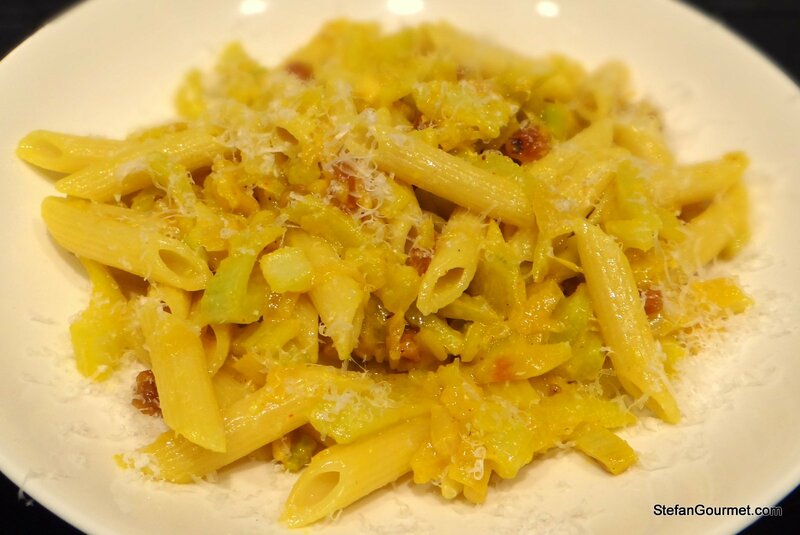 I love pasta dishes with vegetables, such as this Sicilian-inspired fennel pasta with raisins, pine nuts, and saffron. Haha, no wonder why I don’t get as many likes. I rarely back cakes or desserts, I’m a savory kind of gal. But hey, I just do this for fun. I love to read your recipes though, Stefan! 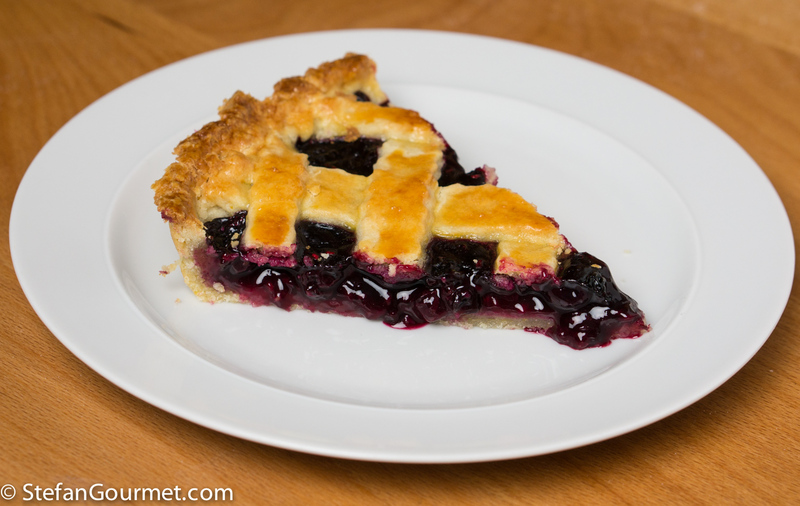 Beautiful looking Tart, I would eat that if you gave me a slice! Very nice tart. You are right, no matter how simple a tart or cake is to make, when you bring it out for dessert, people always are admirative. Wow this tart is beautiful Stefan!! 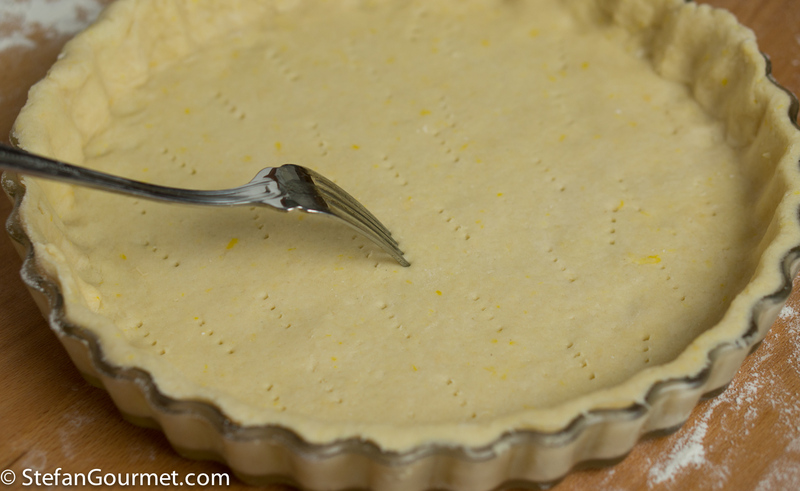 Love the addition of the lemon zest in the pastry crust too… Yum!! Lots of likes, I see :). 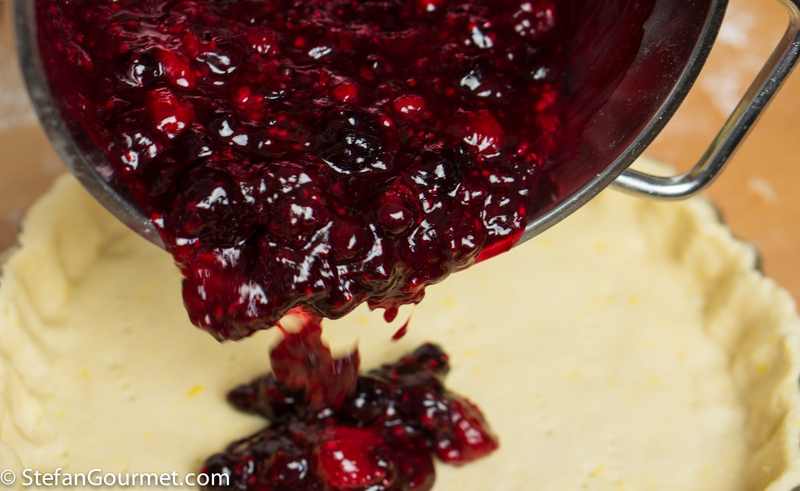 I love the berry filling, full of antioxidants! 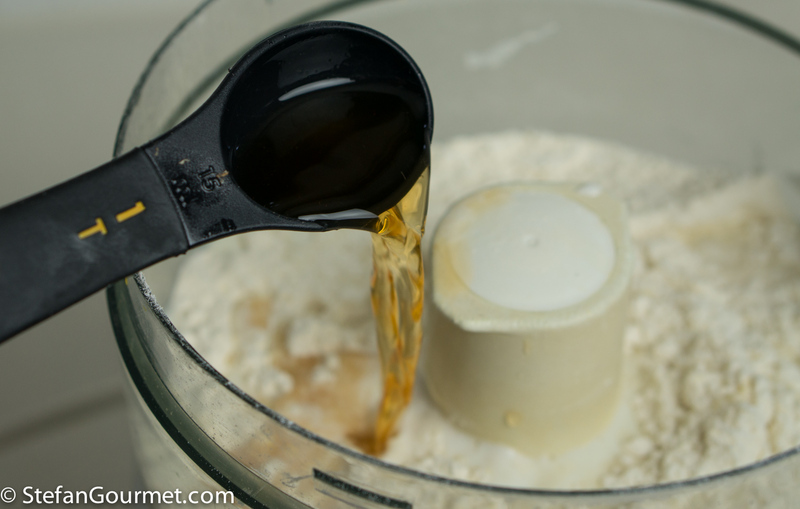 This type of filling would perform well with stevia, as well. Definitely a “try me,” for me, as it will make a great low-sugar dessert. Good idea to make this with stevia. 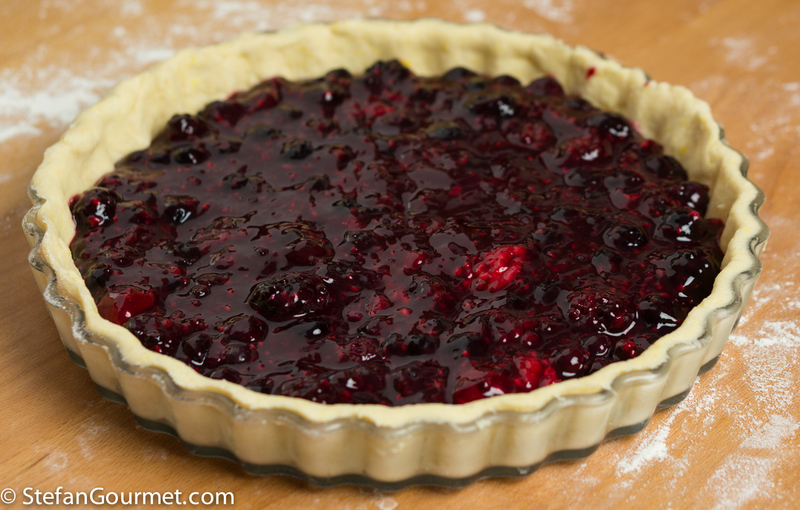 You could also use it to flavor the crust, as the sugar isn’t needed for the texture either. Damn right your crostata looked great, Stefan. 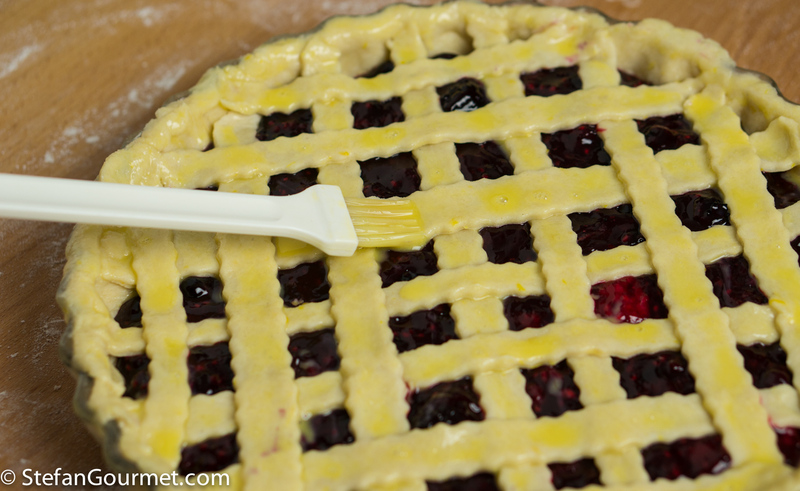 The lattice was perfectly browned, allowing us to peer into that berry delicious filling. 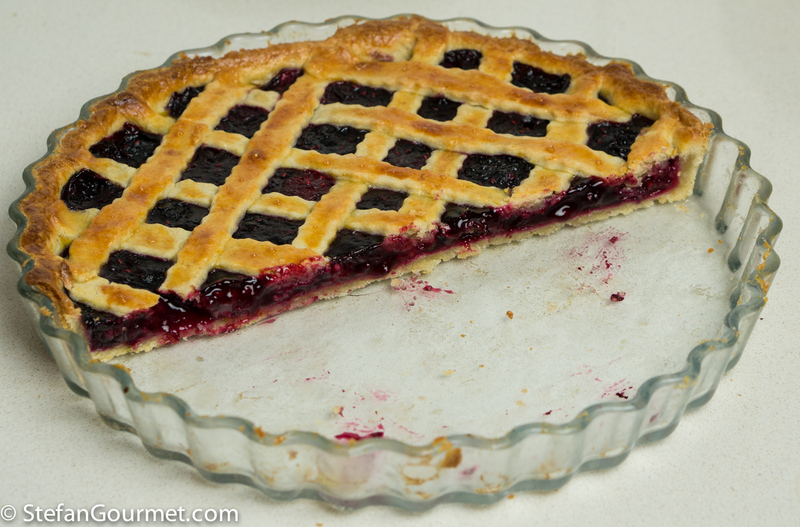 I do like cakes but, if given the option, I’ll go with the tart/crostata/pie choice every time. Fabulous. Loved it & I am still to try my hands on Tart. This is inspirational.